Protected and treasured, this is nature’s theme park where amazing natural encounters are just part of the everyday experience. 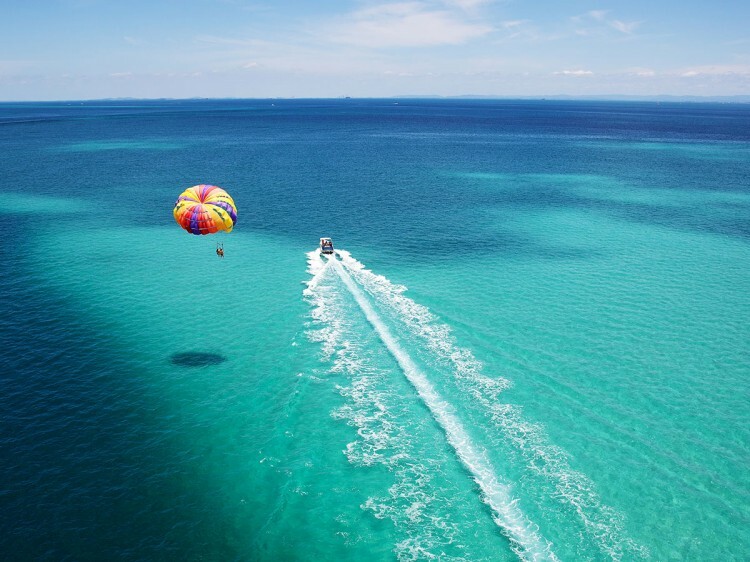 With heaps of tours and activities on offer, Tangalooma is the jewel of Moreton Bay and Island’s region. Activities on offer include ATV Quad Bike Tours, Marine Discovery Cruise, the Desert Safari tour including sand tobogganing, snorkelling sunken shipwrecks and much more! The star attraction at the resort is the unique guest activity of hand feeding a pod of wild bottlenose dolphins! 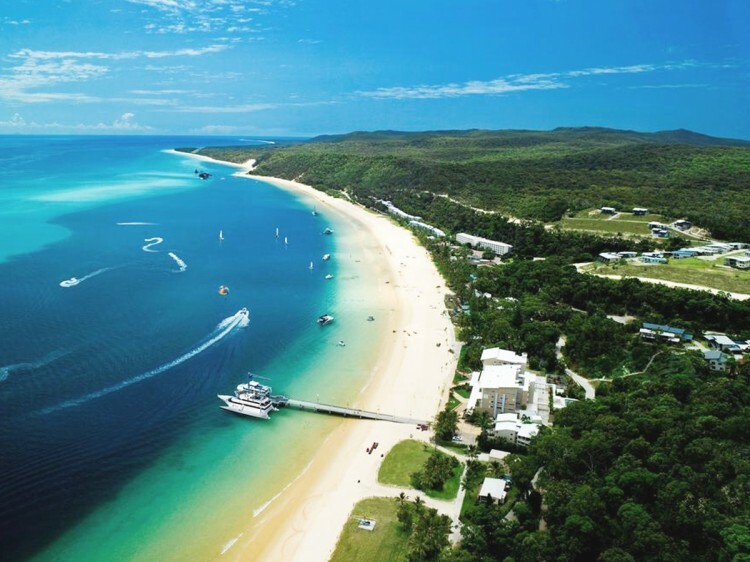 Tangalooma Island Resort offers a wide range of accommodation options to suit all budgets and tastes, ranging from Hotel rooms, Units, Suites and Villas, through to our premium modern apartments and holiday homes - all located with access to what has to be one of Australia's best beaches. The untouched national and marine parks of Moreton Bay make Tangalooma one of the few destinations in the world where visitors can interact with native wildlife in their natural environment. The island welcomes whales, dugongs, stingrays, countless sea birds and turtles but undoubtedly the favourite regulars are the family of wild bottlenose dolphins who visit the shores each evening to be hand-fed by resort guests. Since stealing the heart of resort owner Betty Osborne over 20 years ago, the dolphin family have become a key part of the Tangalooma Story. Experience their beauty for yourself as part of the evening dolphin feeding program. This memory will last a lifetime! Wild Dolphin Feeding - operates each evening at sunset. The Dolphin Care Team, consisting of Eco Rangers and dedicated staff, run the program which operates to strict guidelines to ensure the protection of the dolphins. The dolphins come into feed, usually arriving just after sunset, and of their own accord. To ensure the dolphins maintain their natural instincts and independence, Tangalooma only feed each of the dolphins between 10 to 20 percent of their daily food requirement. This ensures they also hunt for themselves and can survive on their own. Beach Cafe - enjoy bistro-style dining with a large selection of family meals from oven-hot made to order pizzas, burgers, salads, and light meals. Dine outdoors on the beachfront or take away. Coffee Lounge - cool off with a cold ice cream or spoil yourself with freshly made cheesecakes, gateaux, slices and biscuits; the perfect accompaniment to any hot coffee. Fresh sandwiches, wraps, hot pies or sausages rolls are also available. Open daily from 7:30am. Stone - Located in the beach-facing Fire & Stone dining hub. Offering a la carte dining with a familiar Modern Australian cuisine menu it is perfect for resort style dining, with a variety of starters, mains and sweets available. Stone takes its name from its signature dining experience - the Hot Stone. Order Steak Chicken or Fish and cook your meat exactly how you like it yourself on your own personal hot stone. Open for lunch and dinner. Fire - Located in the northern wing of the beach-facing Fire & Stone dining hub offering guests the opportunity to indulge in traditional spicy Sichuan Cuisine with dishes designed to be shared, making this a perfect spot for family and group bookings. A selection of Beef, Pork, Duck and Chicken, as well as Seafood and Vegetarian options are all readily available. B&B Resort Bar - this main resort bar is open daily until late. Offering a selection of popular beer, Australian wine and refreshing cocktails, it is the perfect place to relax at the end of the day. Play a round of pool, watch live international sporting events, or throw some darts whilst listening to emerging local talet playing some great live music. Lucky 7 Convenience Store - stocked with a variety of grocery items, takeaway drinks and snacks, resort wear, souvenirs, newspapers and magazines and pharmaceuticals. Games and puzzles for the kids, toys and DVD movie hire are available here. Located on the ground floor of the Deep Blue Apartment complex and open daily from 7:30am to 5:00pm. Passenger ferry services depart from Holt Street Wharf at Pinkenba, Brisbane and arrive at the Tangalooma Jetty on Moreton Island. Travelling time is just 75 minutes each way, with 4 services operating daily in each direction. For all house guests staying in Tangalooma accommodation the launch fare includes luggage porters to and from your accommodation within the resort. Check-in at Holt Street Wharf is at least 1 hour prior to departure time. Pre-bookings are recommended. Guests staying in accommodation and traveling on the launch transfers are permitted one (1) checked-in suitcase or bag (max 20kg) per person plus one (1) esky (max 20kg) per accommodation booking. One (1) carry-on bag per person is also permitted (not exceeding depth: 23cm, height: 34cm, length: 48cm). Additional or large luggage or items such as surfboards, bicycles can be brought over to the island at additional costs. Includes return launch transfers from Brisbane for resort guests and includes luggage porterage. From the City and Western suburbs: Follow Kingsford Smith Drive outbound, and then approximately 2 kilometres past the Gateway Motorway overpass turn right into Holt Street and follow to the end. From the Gold Coast and Southern suburbs: Follow the Gateway Motorway (toll road) and take exit 106 to Kingsford Smith Drive. Turn right under the overpass and head along Kingsford Smith Drive for approximately 1 kilometre. Turn right into Holt Street and follow to the end. From the Sunshine Coast and Northern suburbs: Follow the Gateway Motorway and take exit 110 - Old Gateway Motorway, and merge on to the Southern Cross Way. Follow for approximately 5.5 kilometres and then take the third exit -Kingsford Smith Drive towards Eagle Farm. Veer left onto Links Avenue North, turning right onto Kingsford Smith Drive when you reach the end. Follow Kingsford Smith Drive for approximately 1.5 kilometres and then turn right into Holt Street and follow to the end. Alcohol - As Tangalooma Island Resort and Tangalooma Launch Services are fully licensed, no alcohol can be brought onto either the launch vessels or the resort itself. Alcohol can be purchased onboard all launch vessels, and also for take away back to your room from the resort bar. Internet Access - Guests have access to 100mb of free data every day at Tangalooma Island Resort hot spots. and can purchase data packs for more bandwidth. General - Only official authorised visitors to Tangalooma Island Resort are allowed to access the food & beverage outlets, Retail or general guest facilities of Tangalooma. Unauthorised casual visitors to Moreton Island are not permitted to use these facilities. Refurbishment work will be commencing at Tangalooma Island Resort from July 2019. Work is being carried out on select guest rooms only. The impact on guests is expected to be minimal, with noise levels being closely monitored. Work will be carried out in 2 stages and between the hours of 8am and 4pm Monday to Friday, it is expected to be completed by December 2019. Comfortable and spacious, the Kookaburra Lodge hotel rooms are a great choice for couples or young families looking for resort accommodation that can sleep up to 4 guests. Located just a short walk from the Resort Centre and only 50 metres from the iconic Tangalooma beach. Views are not guaranteed. Furnished with relaxed island décor, these studio-style units are located only 50 metres from the iconic Tangalooma beach. Perfect for families or longer stays, each unit has a family area and self-catering facilities. Comfortable and spacious, the Kookaburra Lodge hotel rooms are a great choice for couples or young families looking for resort accommodation that can sleep up to 4 guests. Located on the upper floors with guaranteed ocean views, just a short walk from the Resort Centre and only 50 metres from the iconic Tangalooma beach. Capturing the Moreton Island style, these 1 Bedroom Suites are furnished for relaxed comfort and are located only 50 metres from the beachfront. Surrounded by luscious landscaped gardens, tropical Queensland palms and native flowering bushes, designed to take advantage of the refreshing Moreton Bay breezes through large sliding glass windows. Situated to the north of the resort and spanning two levels, these two-bedroom townhouses feature two private balconies with spectacular views across Moreton Bay to Brisbane and the Glasshouse Mountains. The lower level features an open plan living and dining area with a fully self-contained kitchen. The upper level contains a bathroom, two bedrooms and an alcove with additional twin beds. Situated to the north of the resort and spanning two levels, these newly renovated, two-bedroom townhouses feature air-conditioning, two private balconies with spectacular views across Moreton Bay to Brisbane and the Glasshouse Mountains. The lower level features an open plan living and dining area with a fully self-contained kitchen. The upper level contains a bathroom, two bedrooms and an alcove with additional twin beds.